For some individuals, getting older means developing more serious health issues such as dementia and Alzheimer's disease. These can be troubling conditions for both the patient and his or her family members because the illnesses affect memory and cognitive function. People providing elderly home care services can take various steps to help slow the progression of such illnesses, such as playing memory games that can keep the patient's mind functioning. Have a collection of photos with two of each image. Turn them all over on a table and have the senior flip them over to see the image. You want the patient to remember where certain pictures are so that he or she can match together pairs. The game of chess requires a lot of strategy, and working to remember them is excellent for short-term memory work. 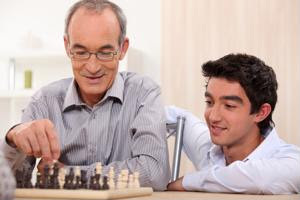 When visiting a patient, challenge him or her to a game of chess to help keep his or her mind sharp. If the individual doesn't know how to play chess, crossword puzzles are another option that require strategy as well. Show the senior pictures of famous people he or she likes, such as singers and actors, and have him or her state the person's name. You can even show photos of friends and family members.